So twice is a pattern isn’t it? I am getting there with trying to get at least this post done each week. So I really think there was an improvement from last week. Such a gorgeous living area. I feel so lucky to be living in this house. Dishes are cleared from the kitchen and benches have been wiped and mostly cleared too. Although I currently have most of my SHE card file spread out on the bench. Mischief has left some of her drawing stuff on the table but at least all of the dishes are cleared. oven dirty – I have no excuse, none at all, I just didn’t get there. mould in the showers … yeah lets not even go there I am squicked out as well. But it was little enough that I genuinely just missed it. Note to self exit mould is my friend in this house! the floors aren’t vacuumed – I vacuumed them 2 days before I just hadn’t done them before she arrived. the door tracks had grass in them – as in dead grass from when we mowed the lawns 2 days ago…. There are some minor bits and pieces that have changed since yesterday chiefly among them that he kitchen was MUCH neater and Mayhem’s shoes weren’t in the middle of the lounge but this is what she was pretty much looking at and we still got busted. But lesson learned, when the agent is a hardass play the game and sweep the damn floors!! But seriously I have an oven cleaning kit sitting in my kitchen and have already exit moulded the showers (I think that will become a weekly habit actually 🙂 ). Well this is what the house looks like at the END of the day, but before I have had a chance to clean up. I completely forgot about posting this morning in my rush to get out of the door. Again from the housework relm, but I desperately wanted to share. Today The Man brought someone home, his boss in fact. I only had half an hours warning that they were on their way, just enough time to whip around and tidy the last of the “stuff” lying around, put some makeup and vacuum the main floors. He probably thought we were a bit odd given that I had a bucket of mop heads in the kitchen sink but I really don’t care, they were sitting in a bucket of disinfectant solution to wipe over any mishaps with the toilet training. They are in the sink to keep them away from Mischief and Mayhem, because while they may not drown each other they absolutely will spread the water over every surface imaginable. 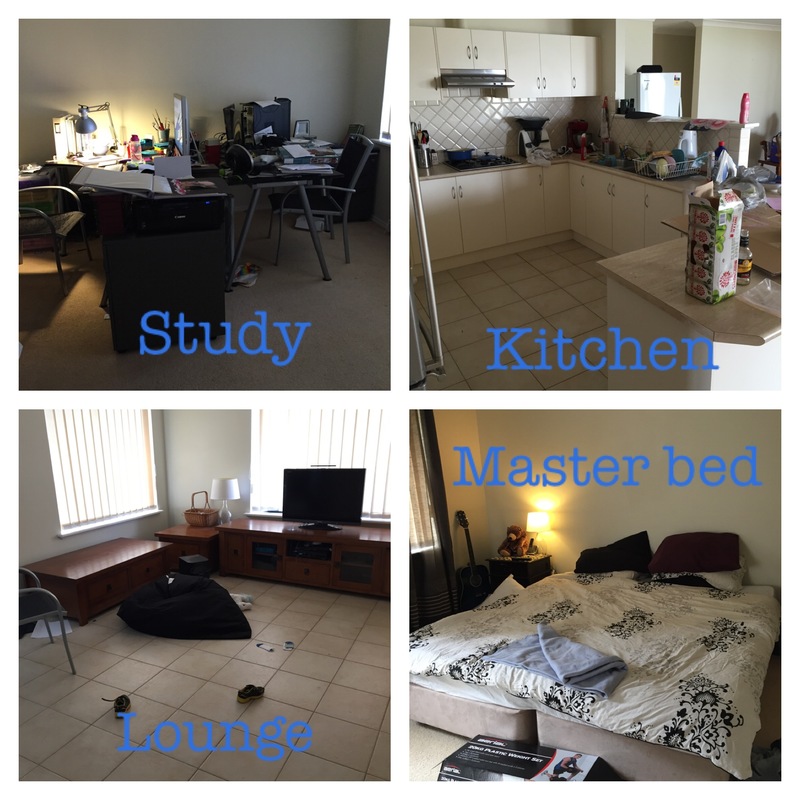 But the thing is the house is clean, tidy, put together and organised. We had clean dishes for his lunch and the table, benches and chairs were clear. This is a first for me, I like it! So worth the work to keep the house up to standard. One of the things I wanted to sort before next year is getting my youngest toilet trained and my middle child nighttime trained. Which is how I find myself sitting on the floor of my laundry while Mayhem is on the toilet NOT weeing! We are staging a sit in because he seems to be peeing every 10 minutes all over my floor, but put him on the toilet and we are currently an hour into our toilet time and there is no sign of urine so obviously he can hold it but just isn’t. It’s like having a puppy in the house all over again.